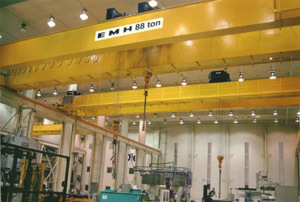 EMH Overhead Cranes in the Plastic Injection Mold Industry | EMH, Inc.
Four large capacity double girder cranes at a Midwestern die manufacturing facility. 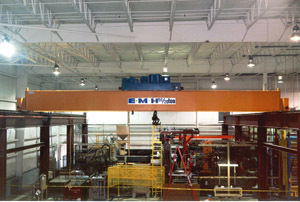 A double box girder crane features a 50-ton main hook and 20-ton auxiliary hook maneuver large molds at a Midwestern automotive plastics plant. The 350-foot runway was completely designed, manufactured and installed by EMH. Crane and runway are completely free standing.